Dawei is an interesting place and we spent a day or so just wandering around. We got up early to watch the monks and the nuns doing their rounds of the city, collecting food for breakfast, and we went back to the market. We drank sugar cane juice, and watched the students at the school opposite chanting their lessons. They started at 6am, reading aloud off the board, all together, like an endless recital of the Lord's Prayer or the Catechism at church. Rote learning was still going at 10.30pm, though surely not the same students? 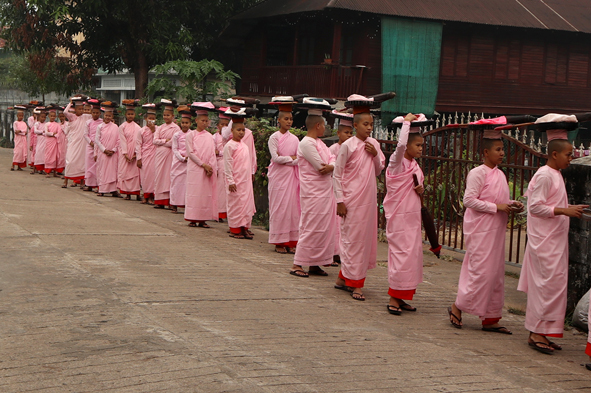 Whacking students with a stick for not knowing their lessons is commonplace at Burmese schools, apparently, though these guys don't seem too traumatised. But then what to do in and around Dawei? We consulted Aye, a super-efficient English-speaking tour operator. 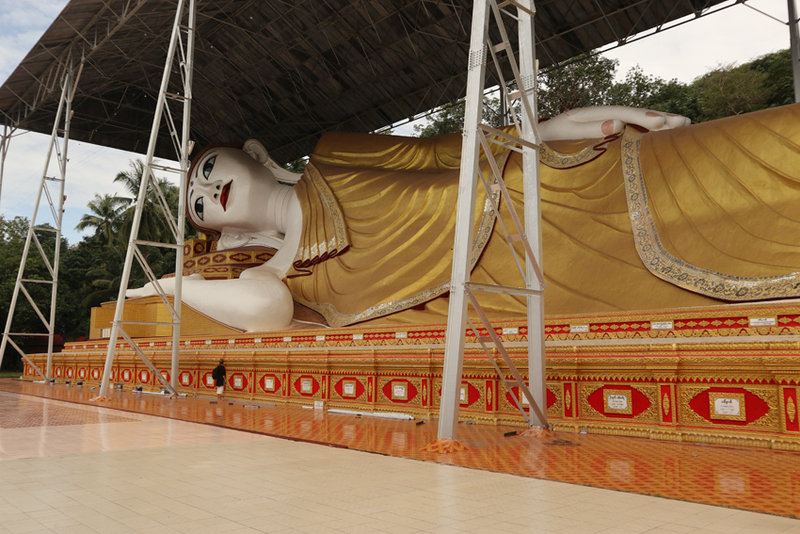 She suggested hiring bicycles and heading out to view one of Burma's huge reclining Buddhas. So we did - we even dragged Sam out on a health-enhancing mission. The Buddha is impressively large and golden and somnolent, though why such a huge statue was built 10km outside a small provincial Burmese town remains a mystery. On the way back we stopped at a roadside stall for our first taste of "laphet thouq", Myanmar's famous spicy green-tea salad, served with peanuts, tomato and cabbage. I know... we shouldn't eat vegetables we haven't seen washed in boiled water, but we were hungry... and it is very delicious. And we emerged unscathed. Next door to the food stall was some betel nut drying on a plastic sheet, and when we went to look we were greeted by friendly shouting from a group of people working in a shed behind. We understood not a word, but "come and have a look, tourists" was the gist. And there was a cashew nut factory, with perhaps 50 women in a open-sided shed wearing gloves and taking the blackened shells off cashews that had previously been boiled in a sort of wood-fired, brick-sided cauldron at the back of the workshop. The women used plastic laundry baskets to scoop the cashews out of the boiling liquid and then put them in a big pile for the women out the front to collect for peeling. It was very Dickensian, complete with health and safety nightmare, but without the smog. The next suggestion from our friendly tour operator friend was the beach. Some of Burma's most beautiful and unspoilt bits of tropical coastline were a couple of hours drive outside Dawei, she said, but with development planned for the coastline, they were unlikely to remain that way for long. And we would drive through interesting villages and down a little jungle track. Sam would love it. It would be an adventure. Go now, she urged. So despite the fact that we'd just come from Greece and before that Cuba, despite the fact that New Zealand has some wonderful beaches, and despite the fact that it's illegal for foreigners to ride motorbikes alone, and our travel insurance would be null and void if we had an accident, we rented motorbikes, pared our baggage down to motorbike proportions, and headed for the beach.